More than 1 / 4 of patients in palliative care have a cancer diagnosis of some kind, according to a recent survey. 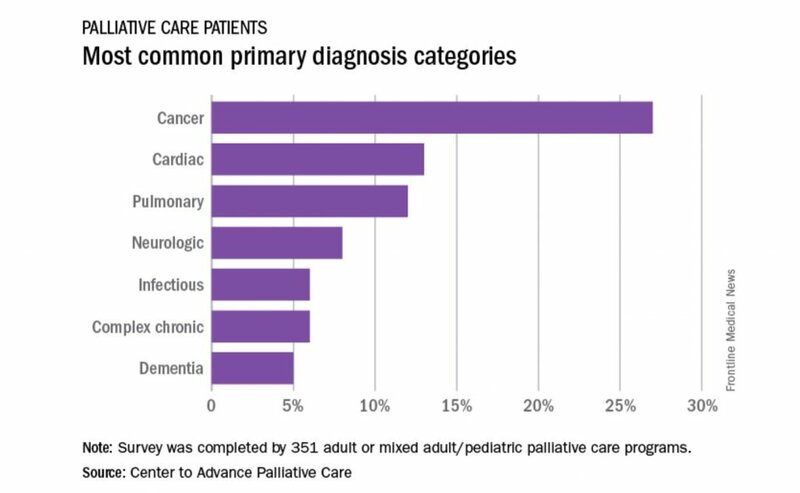 The survey of 351 palliative care programs confirmed that 27% of their patients had been recognized with cancers in 2016, greater than twice as many patients who had a cardiac (13%) or pulmonary (12%) diagnosis. The subsequent most common main diagnosis class in 2016 was neurologic at 8%, with a tie at 6% between diagnoses categorized as infectious or complicated continual, adopted by patients with dementia at 5%. The results were reported by Maggie Rogers and Tamara Dumanovsky, PhD, of CAPC. Since 2008, The National Palliative Care Registry™ has been collecting information from and reporting back to hospital-based palliative care programs. It is the only repository of information about operational features — structures and processes of care of our nation’s palliative care services. The goal of the Registry is to assist hospital palliative care services in tracking their development year-to-year, as well as to promote standardization and improve the quality of palliative care in the United States. Over the past eight years, more than 1,000 programs have participated.